To be specific, I’ve been spending a lot. On what? Food photography related items of course. Most food bloggers and photographers/stylists will understand the dilemma of budget vs want. When it comes to colourful spoons, vintage pots or an extra lens, it’s always easier to buy first and think later. Well, for me anyway. 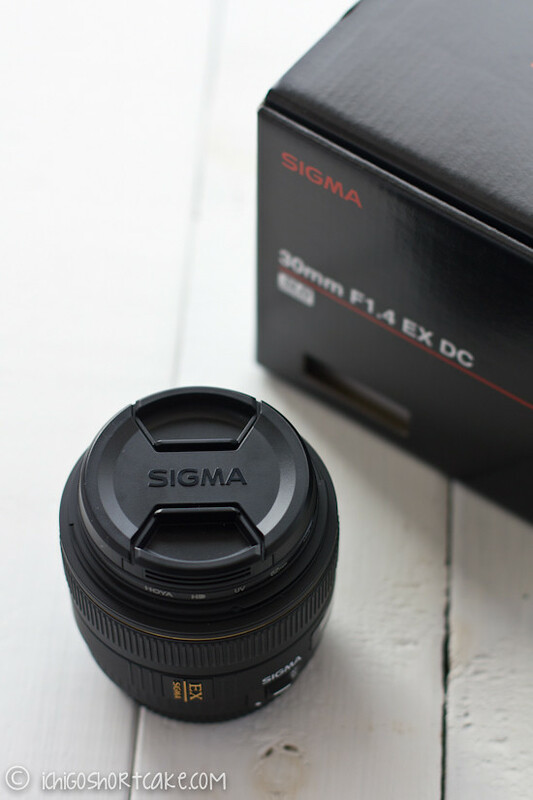 My latest lens addition is the Sigma 30mm f1.4 which I’ve been looking to buy for the longest time. I usually take out my Canon 50mm f1.4 to restaurants because it’s compact, light and works like a charm. Being a prime lens though, sometimes it’s just a bit too cramped in the restaurant to even fit a full dish in. I haven’t had the chance to try Canon’s 35mm f1.4 but due to its hefty price tag, I opted for the cheaper Sigma version. And the verdict? I love it! It’s exactly what I’ve been wanting. It’s a tiny bit heavier than the Canon 50mm but not enough to make much difference. The food photos in this post were all taken with the new Sigma lens. Like many food bloggers and amateur photographers, I’m a big fan of Tartelette, Cannille et Vanille and La Tartine Gourmande food blogs. 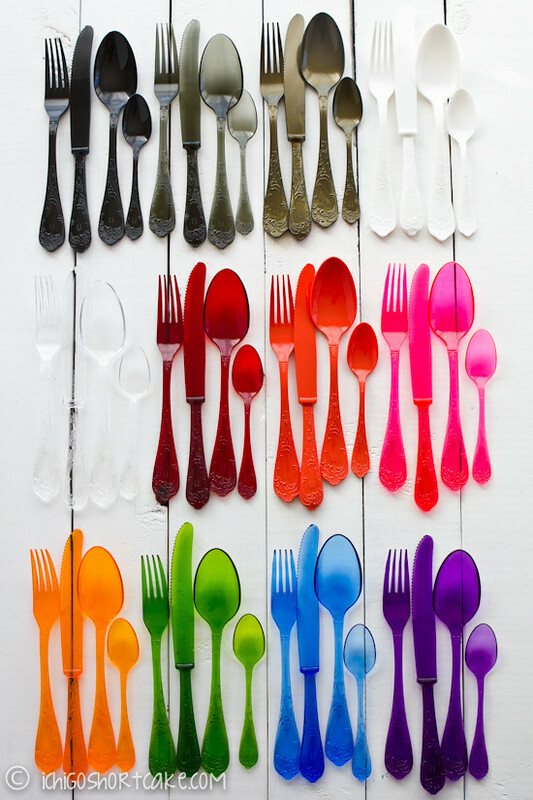 For people who are familiar with these blogs would probably be familiar with the following vibrant, plastic cutlery. Yes, I was so in love with their photos that I purchased the whole 12 sets of this lovely DeLuxe 2000 range from Pandora Designs in Italy. It wasn’t easy making the purchase, both in terms of letting go of the money (12 sets costed a hefty 99euro plus 80euro for shipping to Melbourne through DHL, total costing $230AUD) and the fact that their website was completely in Italian. It became easy enough when I emailed them at info@pandoradesign.it, Daniella who helped me with the purchase was very efficient and nice. I used the orange fork in the above and below photos, but in terms of prices, that’s up to you to decide if they’re worth it. I love them so I’d get them again if I had the choice. Question time: Do you have an addiction to purchasing food props or camera gear? What’s on your wish list at the moment? 3. Crack an egg into a small bowl. Use a spoon or anything long to twirl the water in a clockwise direction until the water is spinning. 4. Let the water settle slightly, then carefully slip the cracked egg into the centre of the pot, keeping the bowl close to the water surface as you do so. The twirling water will keep the egg white close to the yolk. 5. Let the egg sit in the water (which is on low heat) for around 4 minutes and then carefully remove from the water. 6. 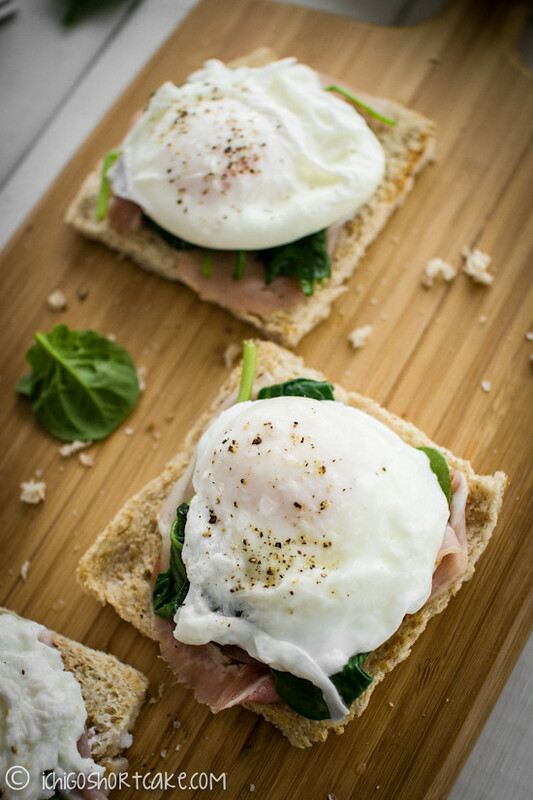 Toast bread and place spinach (slightly blanched or raw), 1 piece of pancetta and poached egg on the bread. 7. Season with salt and pepper and a drizzle of olive oil and serve. I was just telling you about the photography…and here the lens! You know what, I have the exact same lens. We have another sigma brand so we were okay with this brand…. but do you like 30mm? Sometimes 50mm doesn’t fit, and I just locate myself farther than the object. So my husband thought 30mm is necessary so he bought it. I used probably 1-2 times for photo shoot and I didn’t really like that much. Okay that comment is said by armature food photographer…but now that you really like it, I will challenge myself again with this lens (I almost try to re-sell it… lol). 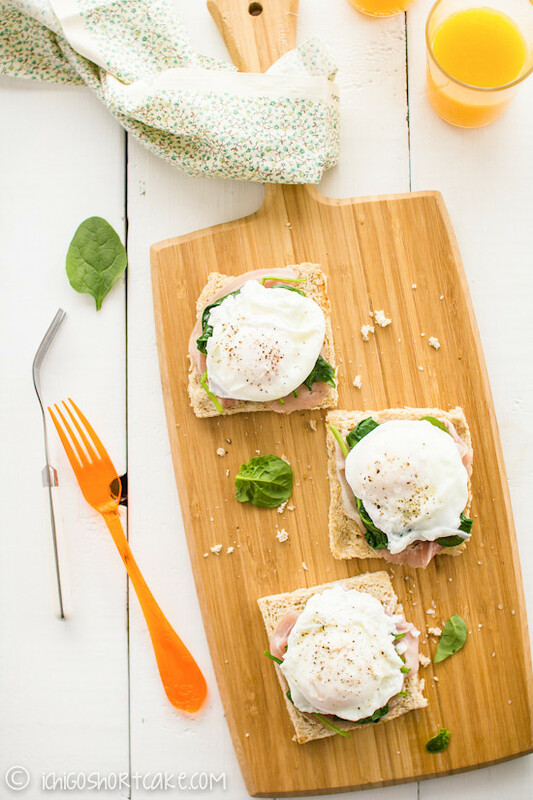 Love your poached eggs. Should make this on weekend! Hi there. Yes, we are both using thesis. I love this picture and poached eggs. I understand exactly what you mean in restaurants with the 50mm and now I’m thinking of getting a new lens. I usually have to push the food to the far side to get the pic. As for the plastic cutlery, that’s a lot of cash, but I’m sure you’ll put to good use. This looks delicious! I cant wait to try it!! 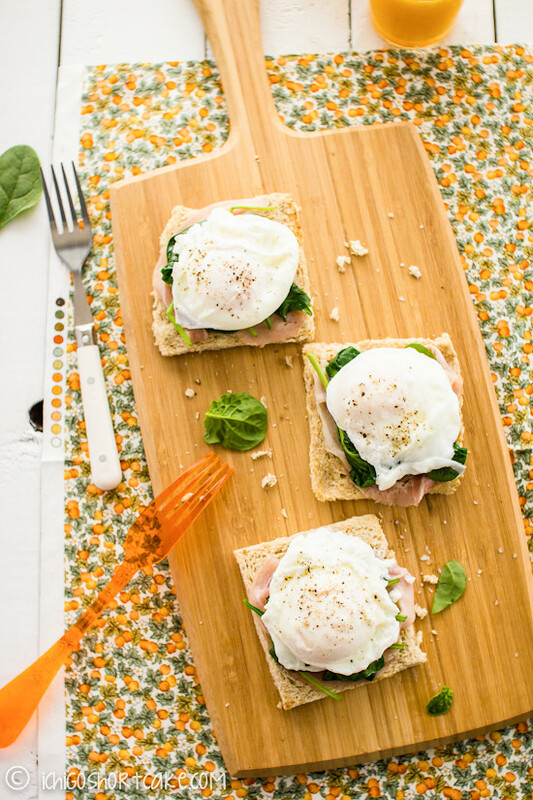 You did really well for your first time making poached eggs. The first time I did it was a disaster! I just bought a 50mm lens and I’m really liking it for portraiture and general “things on table” photos. It’s better in darker conditions than the zoom lens.